An example of a simple state machine is a J-K flip-flop. A J-K flip-flop is sequential device with two inputs, two outputs, and clock input. 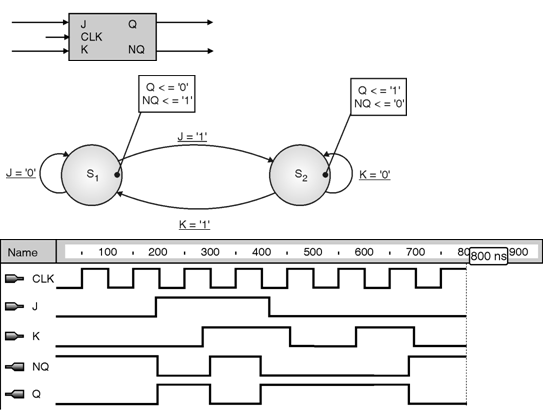 The J-K flip-flop outputs change on negative edges of the CLK signal. The NQ output is the inverted Q output. The Q output turns '1' when J = '1' and K = '0'. The Q output turns '0' when J = '0' and K = '1'. The Q output turns the opposite value when both J = '1' and K = '1'. The Q output remains unchanged when both J = '0' and K = '0'.